Tipperary manager Liam Cahill during last night's All-Ireland U21 semi-final against Galway. TIPPERARY U21 BOSS Liam Cahill admits it is ‘a great honour’ to be associated with the vacant senior manager position on the county but he is placing his focus on their upcoming Bord Gáis Energy All-Ireland U21 hurling final against Cork. Last night in the Gaelic Grounds, Tipperary sprung a surprise in their semi-final against Leinster champions Galway to propel themselves into the decider. Cahill, who managed Tipperary to All-Ireland minor finals in 2015 and 2016, has been identified as a contender for the county senior position in the wake of Michael Ryan’s departure last week. But the Ballingarry native insists his ‘passion’ is for ‘underage hurling’. “To be honest everyone in Tipperary, or everyone should know in Tipperary, that my passion is underage hurling,” Cahill told TG4 after last night’s game in Limerick. “That’s why I’m with this group of lads. Both Mikey Bevans and I, we’re preparing our third team in four years for an All-Ireland. After suffering a 13-point hiding in the Munster decider against Cork, this victory over Galway was a major boost for hurling in Tipperary in the eyes of Cahill. “I believe they revived a bit of hope in Tipperary hurling and in themselves in particular. Great credit to the players. They took a bit of flak and rightly so because of their performance in the Munster final. But fair play to every one of them, to a man they came out with a massive performance tonight. “We really honed in on the future of Tipperary hurling. 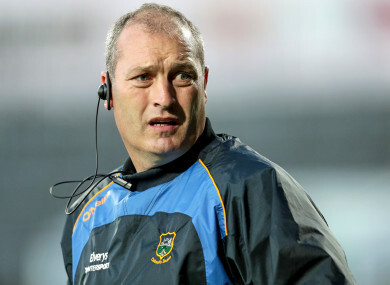 It’s no secret that Tipperary are on the lookout for a new senior hurling manager. Whoever he’ll be, please God he was in the stands tonight, can look down and say hopefully I’ll be able to put my hand on four or five of them lads over the next couple of years to step up and play for Tipperary. And success hands them a second shot at their Munster final conquerors on the weekend of 25-26 August with Cork having qualified as a result of their dismantling of Wexford last Saturday. “It’s a massive incentive for us, I won’t tell a lie,” stated Cahill. Email “'It's a great honour to be associated' - Tipp senior boss contender focused on All-Ireland U21 final against Cork”. Feedback on “'It's a great honour to be associated' - Tipp senior boss contender focused on All-Ireland U21 final against Cork”.